Where is the moon tonight? What aspect of herself is she showing? These are the questions that come to mind when I gaze at the night sky. Maybe it’s because I’m female. The ancients claimed that all women are creatures of the moon. Or maybe it is because I was born in the early morning hours before dawn, just as the moon became full. And on that night many moons ago, the moon rose in the sign of Scorpio, the keeper of the night and the dark mysteries of life, death and rebirth. I am a moon baby. For whatever reason, I have been fascinated by the moon for as long as I can remember. My ancestors used the cycles of the moon to track the passage of time. And I still do the same – in fact, it stuns me that the Gregorian calendar in use all over the world is not linked directly to the cyclic movements of the earth and moon. That’s why we have a silly Leap Year day every 4 years – we need to “correct” the errors in the Gregorian calendar! Whoever thought it was a good idea to ignore astronomy when creating a calendar?! 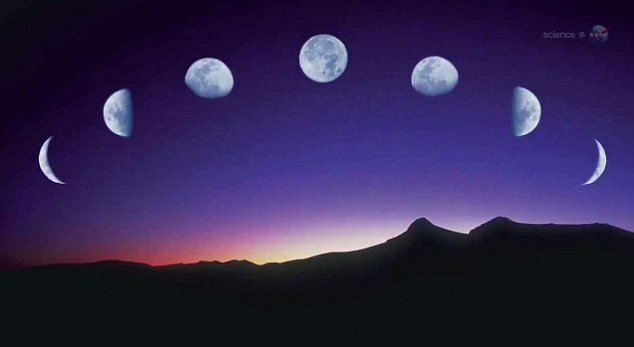 In every solar year (the time it takes mother earth to go all the way around our sun), the moon goes through 13 cycles. There are 13 lunar months in each year, not 12. And within each lunar cycle, the moon slowly shifts from the dark phase of a new moon, gradually showing more and more of herself (waxing) until she complete reveals herself at the full moon. Then she slowly wanes, showing less and less of herself in the night sky until she is not visible at all. Then the moon cycle dance begins again. Our ancestors planned their sacred rituals around the cycles of the moon; they knew that each moon phase holds a specific power. So, when the moon was fully revealed in her full moon state, the ancients celebrated and worshipped the divine feminine energies of birthing and completion. Even today, wise midwives plan their schedules, knowing that many, many babies are born when the full moon exerts her pull on pregnant wombs! Full moons are times of completion. In contrast, when the moon is hidden from view in her new moon state, the ancients saw it as a potent time to plant the seeds for new projects and begin new ventures. Even the timing of farm planting and sowing was tied to the moon cycles in ancient times; not so silly when we realize that the waters and tides of planet earth feel the pull of the moon as well. The next time you’d like to start a new project, try starting it during the dark phase of the new moon. And when you are ready to celebrate an accomplishment or rite of passage, hold your celebration during full moon time. Synchronize with the rhythms of the moon and see how much potency organic timing can add to your life. I love watching the moon go through her dance from dark to light and back to dark each month. I am definitely a moon baby! And I plan to continue my love affair with the rhythms and cycles of the moon until I leave this earth. It keeps me connected to the cycle of the seasons in a deep meaningful way. Share the post "In Rhythm with the Moon"